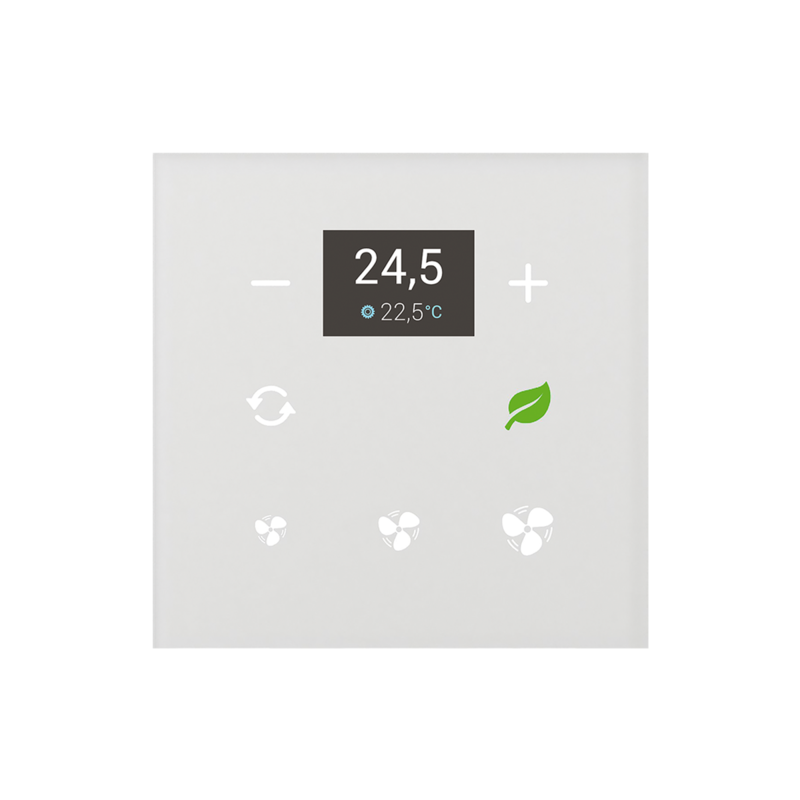 Glass room thermo-regulator GRT3-50 is part of a comprehensive range of glass iNELS control units for guest room management system (GRMS) and serves to regulate the temperature in the room. GRT3-50 thermo-regulator has a display for displaying the current room temperature and desired temperature. 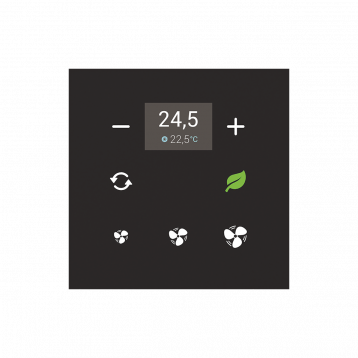 To adjust the required temperature, it is possible to use the touch buttons with symbols "-" and "+". 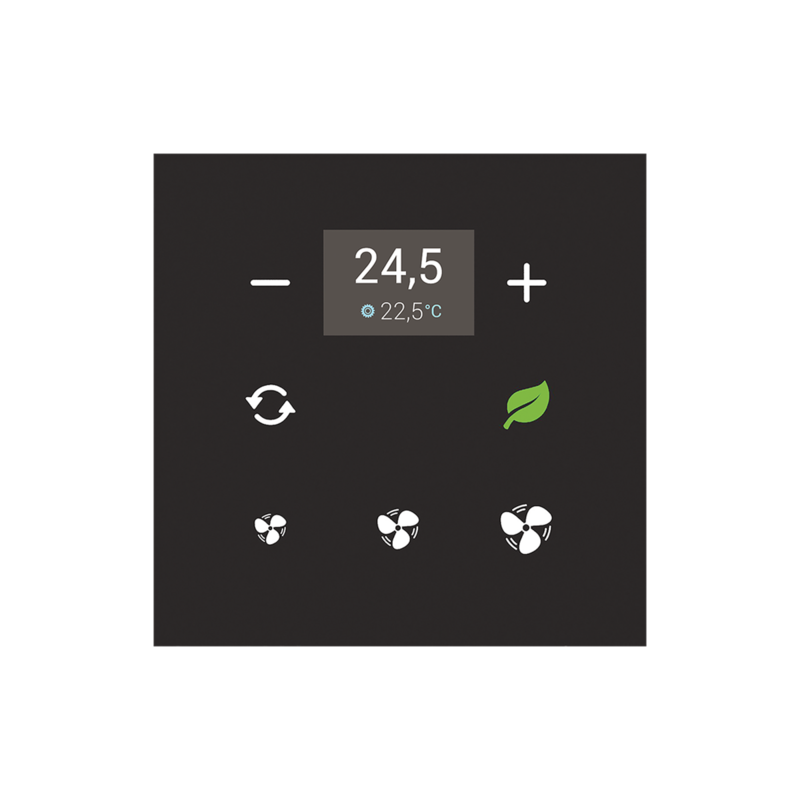 GRT3-50 is also suitable for controlling fan coils and fan speed can be easily adjusted by using the touch buttons with symbols. Thermo-regulator GRT3-50 also has a further two touch buttons whose function can be adjusted by software, for example fan coil on/off, heating/cooling or comfort temperature for heating or cooling. Thermo-regulator is equipped with an integrated temperature sensor for ambient temperature measurement. The glass room thermo-regulator is a design component of the iNELS system and is available in elegant black (GRT3-50/B) and white (GRT3-50/W) version. Printing is possible to customize to the investor requirements. Individual symbols can be illuminated in one of seven colours - red, green, blue, yellow, pink, turquoise and white. GRT3-50 are designed for mounting into an installation box.